Using the ATM2 unit is much easier than getting your brain wrapped around why it works so well. Does your back hurt, but doctors don't know why? Many of our patients have chronic, debilitating back pain -- with no known cause. X-rays, MRIs, and physical exams don't show any significant findings. No herniated discs, no broken bones, no muscle tears, no nerve damage. These patients have apparently normal backs, yet these patients are in pain and can't get relief. These types of pain conditions are very often the result of damaged nerve/muscle pathways. Due to injury, chronic overuse, or bad posture, your body has learned to rely heavily on a small group of overworked muscles. These fatigued, inflamed, and painful muscles are bearing too much of the load and can't get relief. Why physical therapy doesn't work - For situations like this, physical therapy won't work. Your muscles are already overloaded and tired -- how can exercising help? It may actually make things worse. Stretching? It might help, for a little while. But if the damaged nerve/muscle pattern isn't fixed, those muscles will soon be tight again. Pain drugs won't help either, of course. They only cover up the pain, leaving the real problem unsolved. Surgery? Not a chance.Your muscles just need to return to proper, balanced function. And the trick is, you need to do that while you go on working, driving, playing, living. 6 weeks of bed rest aren't going to fit into your schedule. Retrain your muscles and nervous system - be free of pain The only way out of this situation is to retrain your nerves and muscles to function properly, so that you can bend, lift, and move without pain. This is exactly what the Active Therapeutic Movement device does. Our doctors can use it to help you with back pain, neck pain, shoulder pain, and many other conditions that have been difficult to treat. For such an advanced machine, this device appears very simple - an upright, padded surface with a series of belts and straps in key locations. To use it, your doctor will have you stand against the device while he adjusts it to your height and body type. He will use some of the straps to gently change your posture and align your body. You'll then be asked to do some simple range of motion exercises as a way of retraining your body. Sessions typically last about 15 minutes, and they are often paired with another therapy, like spinal decompression, spinal adjustment, heat or cold therapy, or rehabilitation exercise.Based on the Mulligan concept, you can normalize specific movement impairments (dynamic instabilities) by repositioning a particular joint related to the movement impairment. Using the ATM2 you can simultaneously reposition and compress particular joints of the body to normalize most dynamic instabilities causing an immediate reduction of resultant irritation and shearing forces which contribute to dysfunction and pain. The patient is placed in an upright weight-bearing position that immediately and safely allows them to do fully resisted exercises in the direction and range of the previously impaired movement. The Central Nervous System governs the dynamic movement stability components, namely the neural, passive, active (Panjabi, 1992) and emotional components (Vleeming & Lee, 2000). These components work throughout the anatomical structures of the musculoskeletal system. Normal dynamic stability provides the healthy body with the ability to perform normal, good quality, low-energy/high efficient movements. In the case of pain, the CNS will change its neuromuscular activation strategy, to a high energy/low efficient movement. This altered CNS movement control is clearly visible and recognizble in the presence of pain. ATM Rehab. involves neutral-range active functional movements superimposed upon a specific positioning and holding. A few (10-30) movements are performed towards the impaired movement. The passive holding is an essential setup for the ATM Rehab. because it will ensure that the superimposed active movement will alter the CNS activation strategy from pathological to normal. In this starting position the active neuromuscular training will be of therapeutic value, and produce immediate pain reduction and improved range of motion. Perhaps due to improved CNS governed dynamic stabilization of the specific movement. The ATM2 is a clinical device designed specifically to enable clinicians to prescribe quality operated rehabilitation. 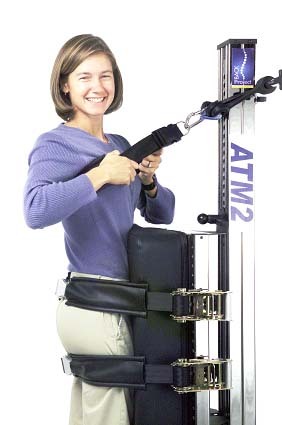 Passive joint repositioning is obtained via restraining belts connected to the ATM2 support pad to reduce the symptoms, and then specific ATM rehab. is performed via a harness connected to a resistance bar. Immediate increase in ROM: Increases efficiency and usage of the core stabilization muscles (multifidus/transverse abdominus) causes immediate relaxation of global movement muscles which result in immediate increase in ROM, with out ever doing inefficient and potentially harmful stretching exercises. Immediate increase in strength: The ATM2 causes muscle sequencing to become more efficient in that less muscle activity achieves stronger more sustained outputs. Immediate reduction in pain: Inefficient and wasteful noise related to the human body being inherently unstable (in the upright, functional position) is significantly diminished - thus more efficiency of movement which leads to more strength and better movement across joints. Furthermore, the ATM2 causes muscle activity to balance out with in the body and facilitate painful movement to become totally pain-free by transition the CNS from a painful movement strategy to one that is free of pain.